A recently signed sponsorship deal has ensured that it really is ‘H20 on the Go’ for one Cornish business. 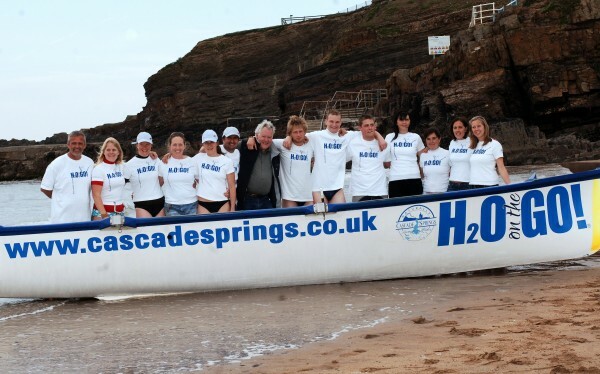 Wadebridge-based Cascade Springs Water Company has agreed to support Bude Surf Boat Club for the forthcoming season. In return for its help, Cascade will have its strapline and logo emblazoned across the crew’s new kit and boats, as well as providing the team with water. The company, which was taken over by William Hiley in September last year, is using the sponsorship as a way of promoting its recent rebrand. “With all these things, it came about by chance,” said Cascade’s owner, William Hiley. “Phil Martin, the Bude surfboat chairman was explaining the sport to me and I thought sponsoring the club would be a great way to promote our revamped brand. “When I took over the business last year I thought the strapline ‘H20 on the Go’ could be used to greater effect for the marketing of the business.